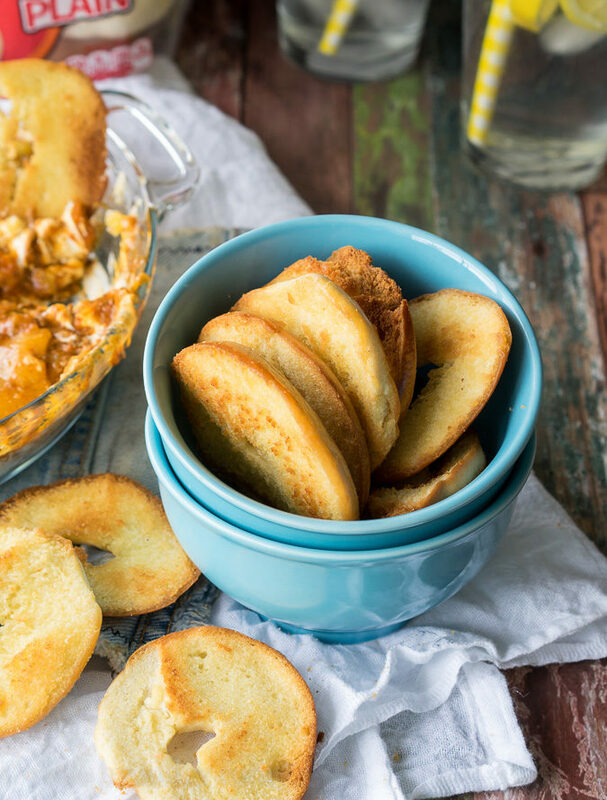 With football season just around the corner, I thought I’d give you one knock-out party dip that’s super easy and ready in just minutes! 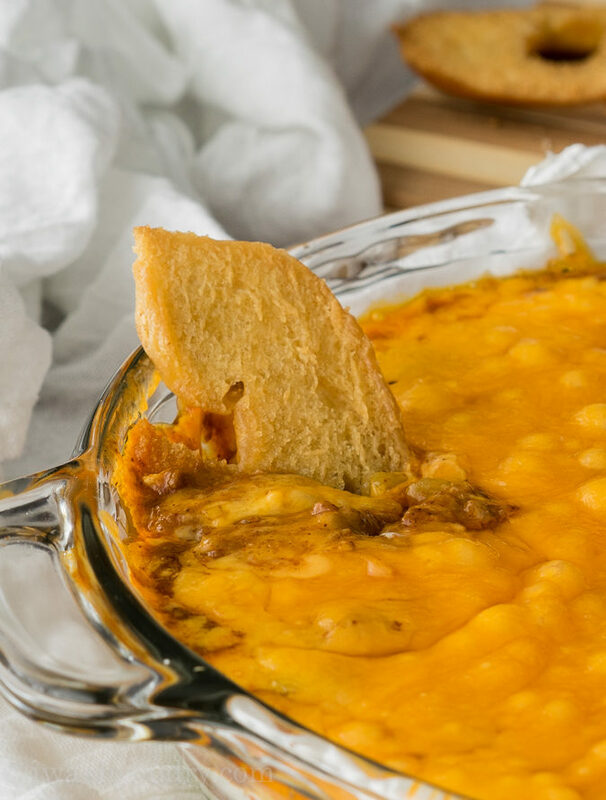 This Cheesy Chili Taco Dip with Homemade Bagel Crisps is cheesy, creamy and full of chili and taco seasonings! The best part about all of this are those crispy homemade bagel crisps! Buying bagel chips can get expensive, but making your own takes just a few minutes and you can season them just the way you like. I grabbed a bag of Thomas’ Mini Bagels and used my bread knife to slice them into as thin of discs as possible. 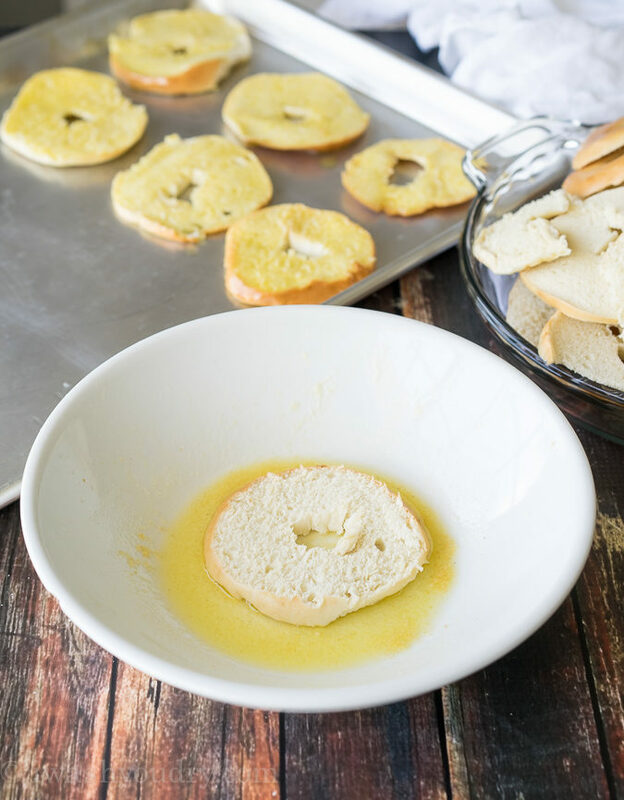 Once the bagels are cut, just dip them in a butter/oil/garlic salt combo and bake them until they’re golden and crispy! 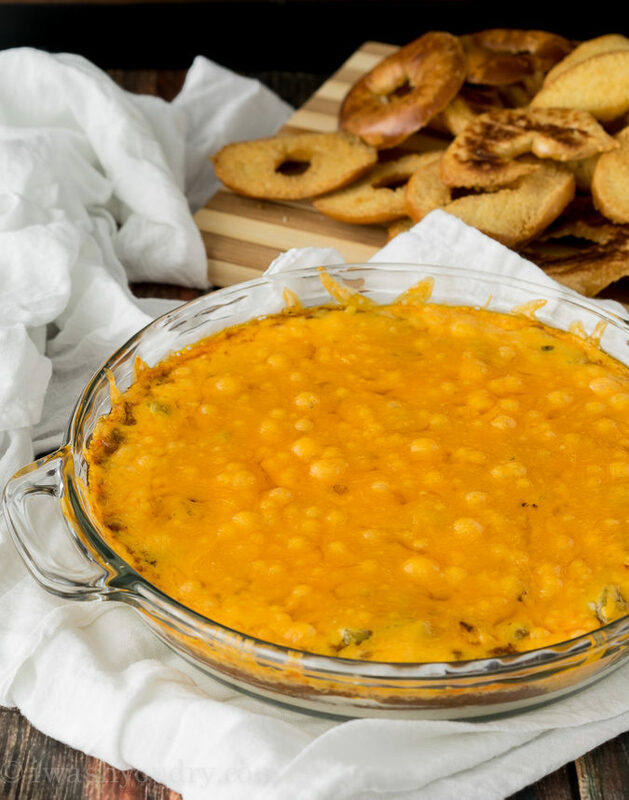 The dip part of this crazy-good party snack is even easier! Start by spreading a layer of cream cheese in the bottom of a pie plate. Anything that starts with a layer of cream cheese is a winner… am I right?! Spread a layer of chili over the top of the cream cheese. I used a no-bean version. It reminded me of the chili that you put on top of hot dogs… oh so good! After the chili goes on, layer in some diced green chilies and sprinkle on a package of taco seasoning! Trust me, it’s sooooo good. Do some extra laps around the track. 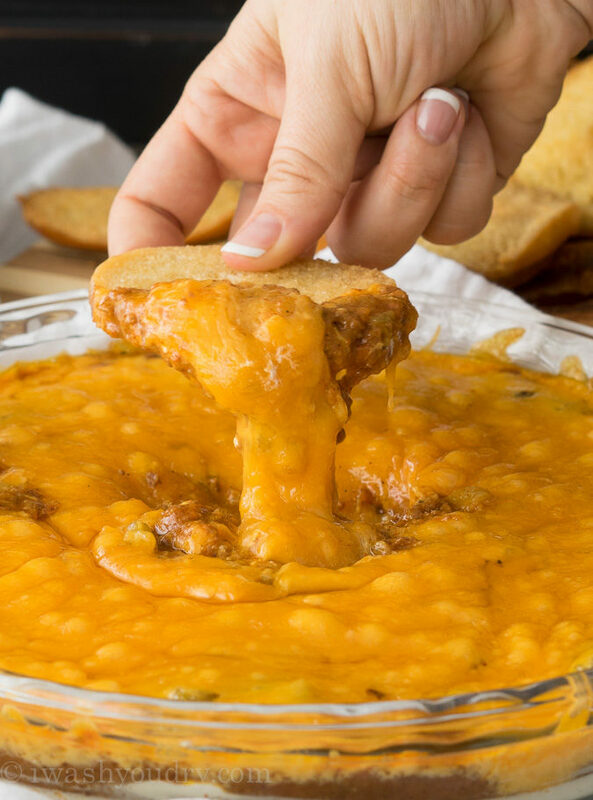 Finish the dip off with a little (pshh…pile it on!) cheese. Now here is the best part! You can either microwave this bad boy, or throw it in the oven. Obviously if you’re microwaving it, you’ll want to make sure you placed it in a microwave safe dish. Don’t blame me for blowing up your microwave if you use a metal pie tin! 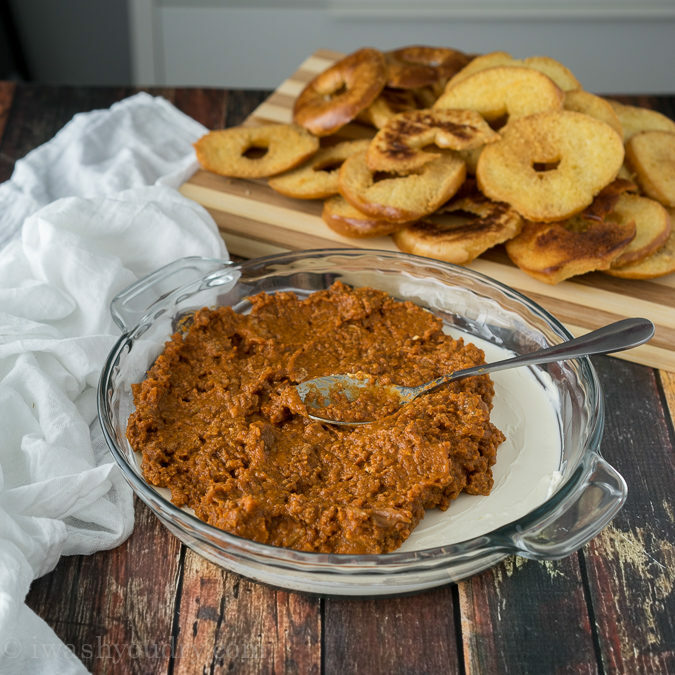 Once the whole thing is bubbly and hot, it’s ready for some bagel crisp dipping action! But just wait till you reach that layer of cream cheese and chili… the combination is out of this world. 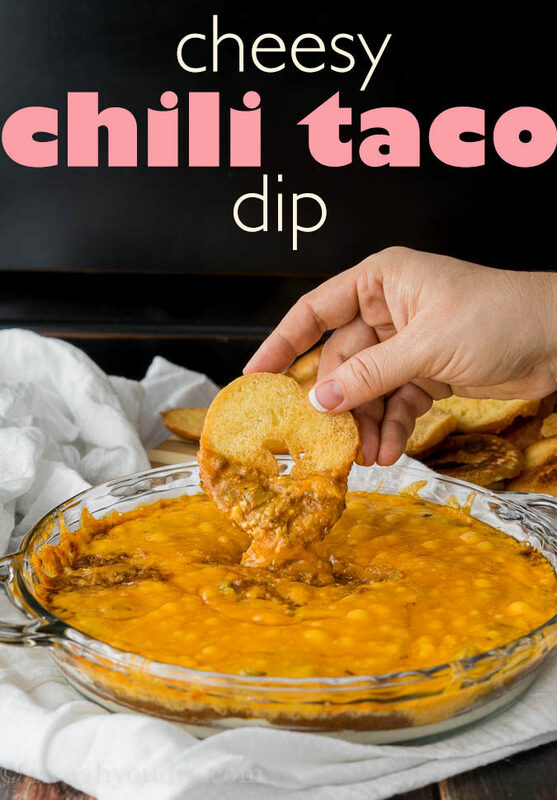 This is definitely a party dip that will be gone in a flash. 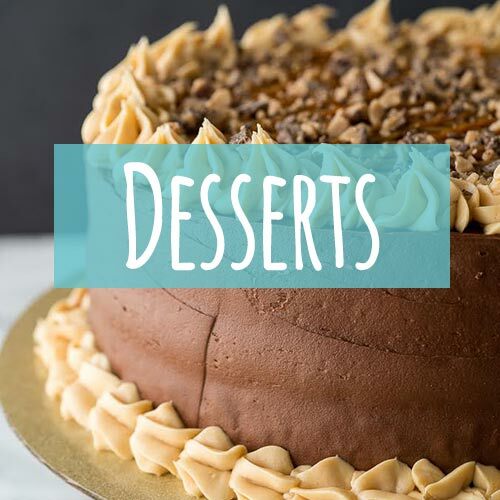 You might want to make a double batch! 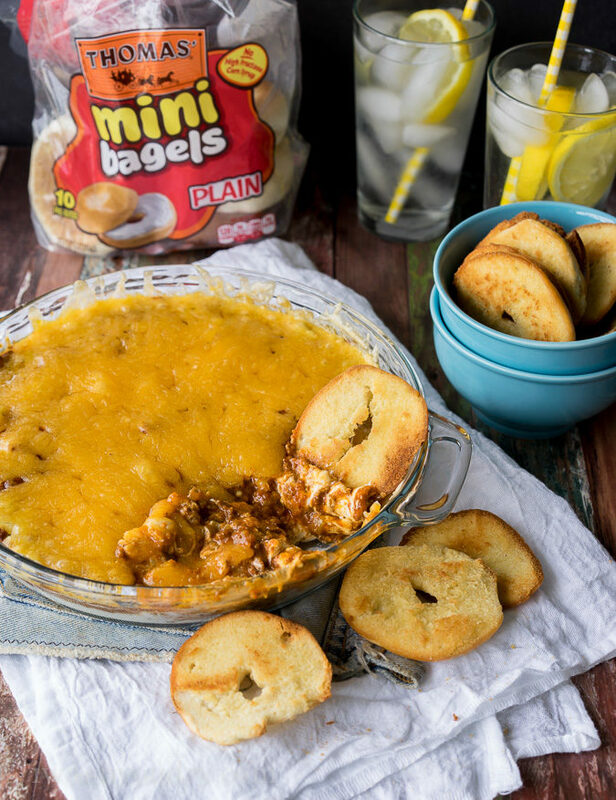 Cheesy Chili Taco Dip with Homemade Bagel Crisps is a knock-out party dip that’s super easy! 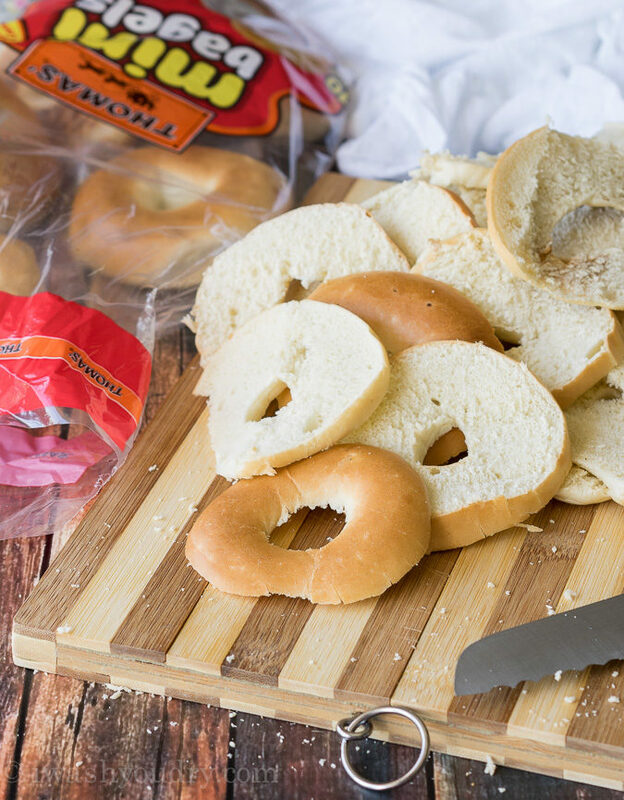 Thinly slice the mini bagels so they are about 1/4 inch thick discs. 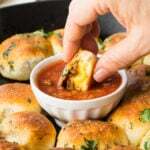 Combine the melted butter, oil and garlic salt in a shallow dish and dip each bagel slice in the mixture and let any excess drip off before placing in a single layer on a baking sheet. 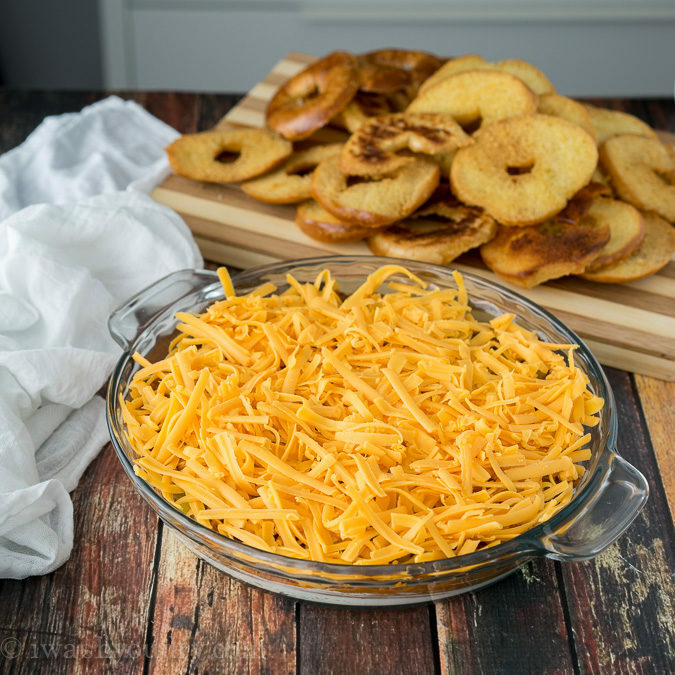 Bake for 7 to 8 minutes, flip the bagel crisps over and bake for an additional 5 to 7 minutes, or until the crisps are a golden brown. Remove from baking sheet and let cool. Keep oven on. Meanwhile prepare the dip by spreading the cream cheese in an even layer in a 9 inch pie pan. Top with the chili, green chilies and then sprinkle the top with the taco seasoning before spreading the shredded cheese all over the top. 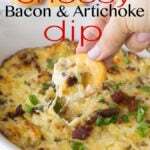 Bake the dip for 10 to 15 minutes, or until the cheese is melted and bubbly. 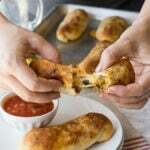 Optionally, you can microwave the dip mixture for 3 to 4 minutes, until the cheese is melted. disclaimer: This post is in partnership with Thomas’ Breads. All thoughts and opinions are 100% my own. Thank you for supporting the brands that make I Wash You Dry possible. My hubby loves this! I will have to make this for him! 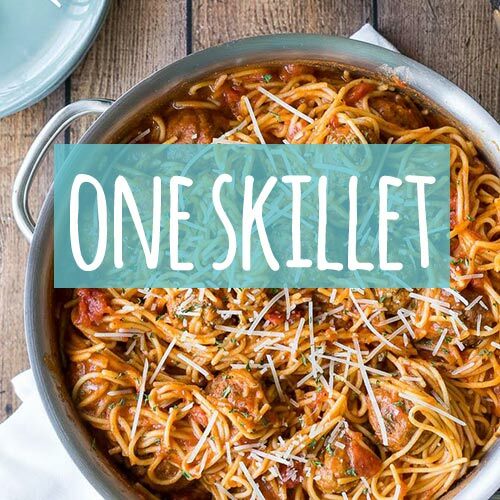 Do you think you could make this in a crock pot? 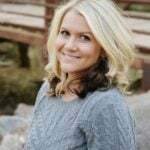 I will try your recipe, thanks for sharing ! Drooling over your dip!! Great idea to use the bagels as the dipper 🙂 Love! 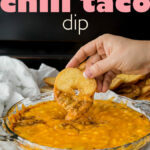 First, this dip looks fan-freaking-tastic! Second, why have I never thought to make homemade bagel crisps? They look delicious and I love Thomas’ Bagels! My hubby won’t let me forget that it’s almost football season! We fiend bagels in this house, so these crisps are perfect! Pinned! Love that you made your own chips! I cannot believe I’ve never made bagel crisps on my own. What a great idea!! Love this dip too, just give me a spoon! Yum! What a tasty looking dip & I love the bagel crisps. 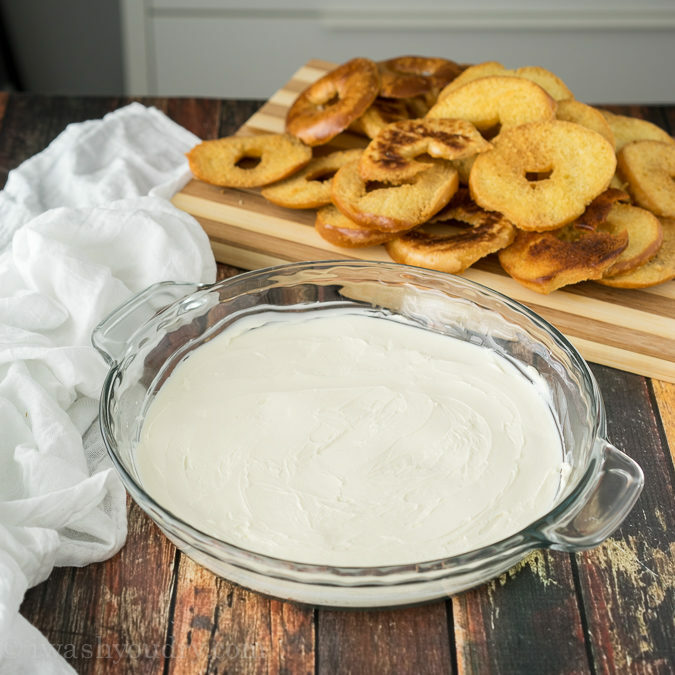 I’m loving those homemade bagel crisps! So fun! And that dip.. no words. It’s like the chili of my dreams. The perfect ratio of creamy, savory, and cheesy. LOVE!